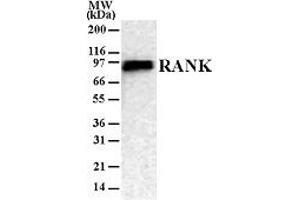 Western Blot: RANK Antibody (9A725) [ABIN252472] - Western blot analysis of RANK in 293 cells transfected with RANK cDNA. A single protein band with an approximate mol. wt. of 97 kDa is detected. Flow Cytometry: RANK Antibody (9A725) [ABIN252472] - Flow analysis of RANK in RAW cells using 2ug of ABIN252472. 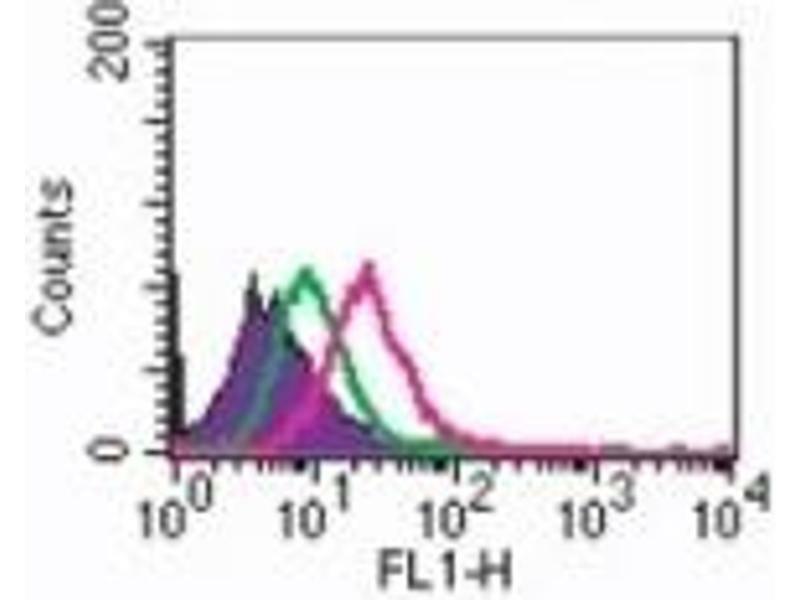 Shaded histogram represents RAW cells without antibody, green represents isotype control, purple represents anti-RANK antibody. Flow (Cell Surface): RANK/TNFRSF11A Antibody (9A725) [ABIN2524728] - Analysis using the PE conjugate of ABIN2524728. 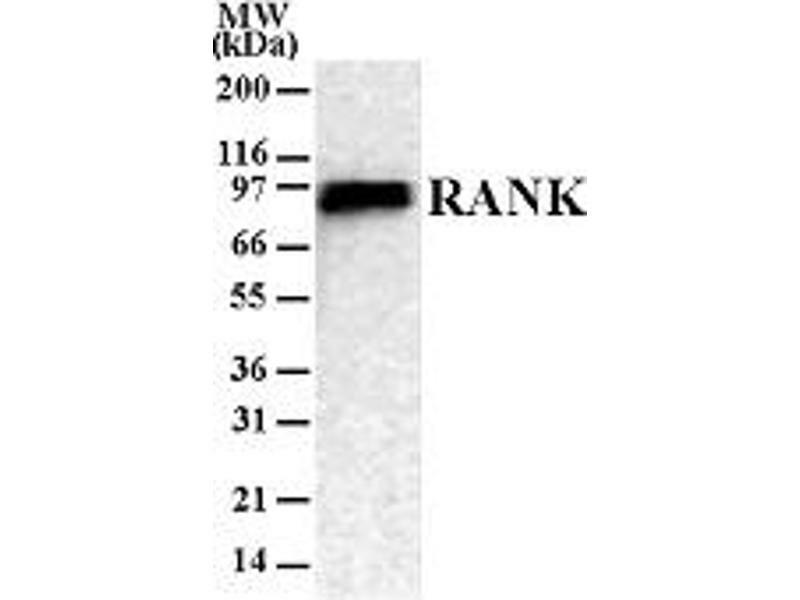 Staining of RANK in RAW cells using 0.5 ug of RANK antibody. 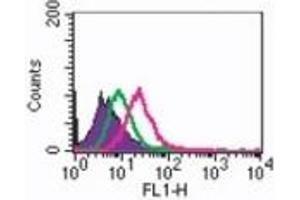 Green histogram represents isotype control; red represents RANK antibody. 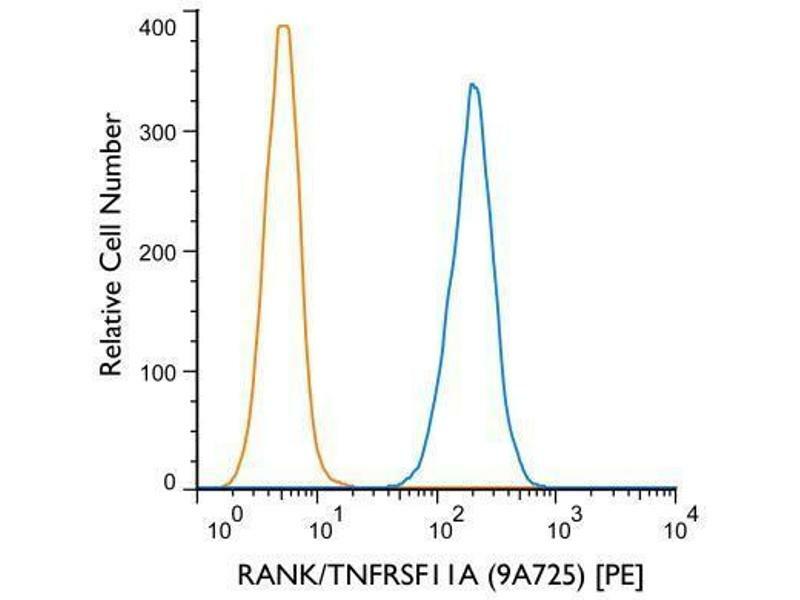 Flow Cytometry: RANK/TNFRSF11A Antibody (9A725) - Using the PE direct conjugate An intracellular stain was performed on K-562 cells with RANK/TNFRSF11A (9A725) antibody (blue) and a matched isotype control NBP1-97005PE (orange). Cells were fixed with 4% PFA and then permeablized with 0.1% saponin. Cells were incubated in an antibody dilution of 1 ug/mL for 30 minutes at room temperature. Both antibodies were conjugated to Phycoerythrin. Spezifität In RAW cells, a 97 kDa is observed. Immunogen A fusion protein containing amino acid residues 326-616 of human RANK was used as immunogen. 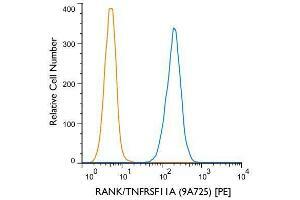 This antibody recognizes an epitope located between amino acid residues 330-427 of human RANK (NP_003830). Lafferty, Fantry, Bryant, Jones, Hammoud, Weitzmann, Lewis, Garzino-Demo, Reid: "Elevated suppressor of cytokine signaling-1 (SOCS-1): a mechanism for dysregulated osteoclastogenesis in HIV transgenic rats." in: Pathogens and disease, Vol. 71, Issue 1, pp. 81-9, 2014 Von den Autoren verwendete Methode: Flow Cytometry (FACS) (Probematerial (Species): Rat (Rattus)).